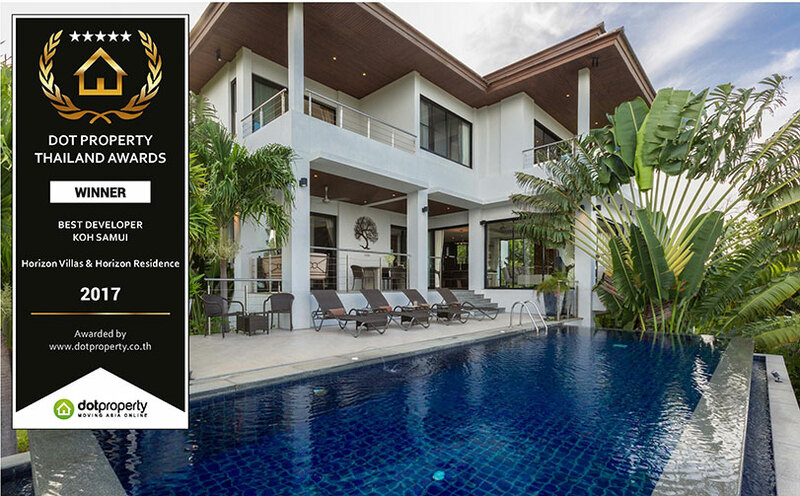 Horizon Homes has been awarded Best Developer Koh Samui for 2017 by Dot Property Thailand, in particular for our Horizon Villas and Horizon Residence developments on Koh Samui. We would like to congratulate all of our partners, collaborators, and clients on a job well done. Click here to read the full article. To read the full issue of Dot Property Magazine issue 19, please click here. 4 bed room sea view villa, 35 Mn Thb. 3 bedroom garden villa, 12.9 Mn Thb. 3 bedroom sea view villa, 14 Mn Thb excluding furniture and built in wardrobes. Built off-plan, takes 1 year to build. 4 bedroom + 3 bedroom + 2 bedroom villa being sold together for 105 Mn Thb fully furnished.